At the invitation of curator and founder of the beautiful new Bainbridge Island Museum of Art, three of Steve’s playable music sculptures are on display in the “First Light” Gallery from June through mid-September 2013. It’s a short ferry ride from Seattle direct to the breathtaking “green” building that stands in prominent welcome across from the ferry lot. The following is “The Ukelimba Story” and the history of Steve’s evolution as a green artist. My “go to” uke is a Kala “C-tuned, low G” cutaway baritone that arrived at my doorstep in a box filled with broken ukes sent to me by Kala a few years ago. It was broken into three or four pieces, and all the electronics had been ripped out, leaving gaping holes. It was a mess! “Guns for Ukes” and “Ukes Without Borders” grew into slogans from our “Johnny Appleseed” tour as Ukalaliens (2009-2012). Kala Brand Ukulele Co. generously supplied us with most of the artillery (aka ukuleles) necessary to help spread the gospel of the uke; a natural outcrop of the “Ukulele Convergence” we held at Artichoke Music in Portland, Oregon back in 2001. That event inspired us to write the “Ukalaliens Songbook” and to dedicate some time, travel and teaching to the conversion of non-musicians to the joys of making music after we sold the store and hit the road. Crispin Mungure, Zimbabwe iin 2003. 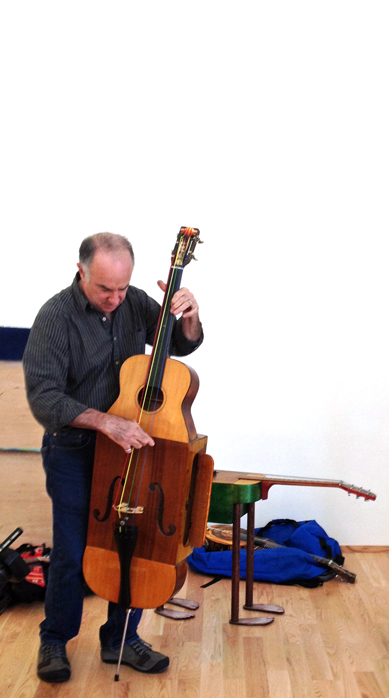 Steve Einhorn shares Crispin’s guitar with students in Troy, OR. While running my music shop, Artichoke Music in Portland, Oregon (1981-2007), a few encounters instigated what has become my passion for reshaping found materials into unique musical instruments. I met a retired school teacher from Montana who sold me a very playable and nice sounding guitar and banjo he had made using corrugated cardboard for the bodies and scrap pine lumber for the necks and a little bit of interior bracing. In 2003, I traded a store-bought guitar to a boy, Crispin Mungure from Zimbabwe, for a guitar he built from an old hollowed out plank of wood and a flattened vegetable oil can for the body and neck and stripped bicycle brake cables for strings. Crispin wrote and played beautiful songs on his home made guitar in his village and in coffeehouses in Harare, Zimbabwe. The only “store-bought” material I’ve used in the construction of my Ukelimbas is 5-Minute Epoxy and Super Glue to repair any cracks or loose braces. Some bracing is impossible to access by hand so there is some buzzing and other rogue vibrations that “enhance” the sound of the vibrating metal keys. What if we all “lay down our swords and shields, down by the riverside” – picked up our ukuleles and played a song together … and what if we re-purposed all our guns into ukuleles? Wouldn’t the world be a better place? Back in 2009, under the moniker of The Ukalaliens, and with the sole purpose to put ukes in the hands and songs in the mouths of as many people as we could find, my wife and music partner, Kate Power and I hit the road with two dozen Kala Travel Tenor Ukuleles in tow. Our tour route took us around the country across thousands of miles and the response was stupendous! The look of surprise and delight as people played their first chords was worth more than gold – it was a life changer. Being peace-loving music makers, the Ukalaliens dreamed up a new program we announced to concert audiences; “Guns for Ukes” and “Ukes Without Borders” became slogans to promote peace through music and art. “Trade us your gun and we will give you a ukulele in exchange and teach you to use it …and while we’re at it, let’s turn that gun into a uke. The gun came in. It was an old Mossberg .22 rifle traded to me by Ann, an Eastern Oregon big-game hunter, for a nice Kala tenor uke. 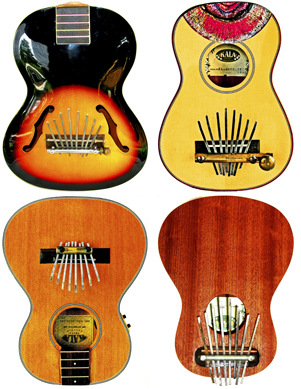 Steve filleted the rifle stock and cut the rest into several pieces and rebuilt it into the “Peace Piece”; an electric lap-steel ukulele – to which a scrapped Kala fingerboard was added. The words “Recycling” and “Re-Purposing” have become key words in pop culture. What do these words mean? One organization that is doing some monumental work in that vein is the Landfill Art Project. The earth has limited resources to draw from. Music, art and new compositions await creation and recreation with discarded materials and a little imagination. Remember that uke that you ran over on your way to the gig? You didn’t throw it away, did you? (Pictured clockwise above: just a fraction of the useable materials found on the street on the knolling table in Steve’s studio, Steve playing “Bass”, “Hank”, electric lap-steel guitar, and “Anchovy Uke”). Three of Steve’s playable music sculptures are currently on exhibit at the recently opened Bainbridge Island Museum of Art, a short ferry ride from Seattle in Bainbridge, Washington. The inaugural exhibit runs from mid-June to mid-September 2013; and others will be shown at the Museum of the Shenandoah Valley in Winchester, VA in September 2014 in the “Hubcap as Art” exhibit (click for YouTube of Steve wth resonator hubcap guitar). More information on Steve Einhorn art is available by email to steve@qualityfolk.com or visit www.qualityfolk.com. Steve Einhorn and Kate Power are Pacific Northwest artists dedicated to promoting peace, community and sustainability through art, music, writing, performance art and collaborative action. The original concept, design and name of the “Ukelimba” ©2011 is the original creation of Steve Einhorn and may not be reproduced without explicit permission. All Rights Reserved. Co-creators of the Ukalaliens, Ukes Without Borders, Kate & Steve have converted countless new ukulele players in the world and are dedicated to spreading goodwill through the arts. Steve & Kate reside in Seattle, Washington. We welcome your comments and thank you for sharing us with your friends.